The Geoprobe 66 series soil probing machines are taking direct push capabilities to new depths! These power-packed machines are equipped with Geoprobe's powerfully engineered GH60 Hammer, an optional Auger-head attachment, a wide stance for added stability, and extra power for heavy-duty site investigation needs. This machine is especially ideal for Dual Tube soil sampling with 3.25-inch probe rods, setting permanent monitoring wells with Geoprobe's 5 ft. Prepack Screens, and logging. 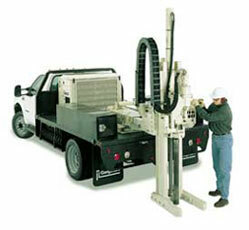 Geoprobe 66 series machines can be purchased with three different carrier vehicle options (as seen here). The 6600/flatbed and 6600/PC111 are our truck-mounted options; and the 66DT is a track-mounted machine. Geoprobe 66 Series Machine Benefits. . . Integrated Rotation. Rotation is always available to do the chores most often encountered in direct push work, including augering. 613 ft. lbs of torque lets you drill up to 40 ft. with 4-inch augers. An optional add-on rotary head for hollow stem augering is also available. GH60 Probing Hammer. This next generation hammer takes you into another realm of driving. Delivers energy directly to the drive cap with no intermediate anvil. Can deliver more than 50,000 pounds of force per blow 32 times per second. Built in rotation gives you 613 ft. lbs of torque for concrete drilling, turning in anchors, or augering. Stringpot ready. Electronic depth measurement will be a common part of your work as Direct Image logging grows in usage. The 66 machine puts the stringpot cable in a protected location and keeps you free from worry. Rod Grip Pull. Originally introduced as an add-on to the GH40 hammer, the rod grip pull system is a labor-saving device that no prober wants to be without. It speeds the rod retrieval process and eliminates the need for a pull cap. Can work with probe rods up to 3.5 inches in diameter. This pulling device is integrated into the body of the GH60, keeping rod pulling as close as possible to the center of force. True-Pull Cylinder. Gives you 20 tons of pulling power at 2,100 psi, but does not sacrifice speed. You can cycle this cylinder from bottom to top in just 5 seconds! 66-in. stroke allows you to use 5-ft. tools. Hammer Mounting. Low friction slides allow the GH60 Hammer to absolutely glide up and down, yet designed to withstand the force moments that the 66 machine's incredible pull force generates. This minimizes hammer vibration and play. Serviceable Control Panel. The front panel removes with just four bolts so adjustments or repairs are easy to access and can be performed while the machine is running. Anvil-less Hammering. Maximizes efficiency by putting percussion direct to the drive cap with no intermediate anvil. Removable Foot Extension. Geoprobe 66 probing machines literally stand on their own feet! They are able to perform pulling with no structural support from the carrier vehicle. The foot is removable and allows you to put on the foot you need for your terrain and sampling or logging function. After extensive testing and refinement, Geoprobe Systems offers the next model of hydraulic hammer designed specifically for probing applications. Efficient transfer of energy from the hydraulics to percussion has led to a hammer that drives tools faster and to greater depths than ever before. New features, such as an integrated rod grip pull, 20-ton pulling capacity, and re-engineered mounting system, insure that the GH60 is not only a bigger hammer, it's also a better hammer.